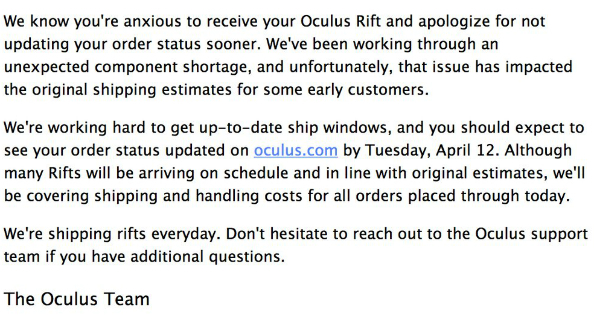 If you’ve been waking up every morning and frantically refreshing your inbox to see if your Oculus Rift has shipped yet, we have good news. And a little bit of bad news. 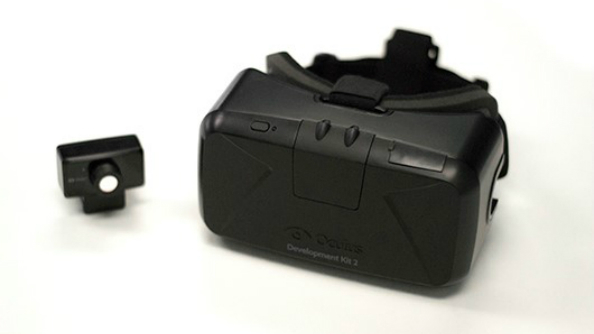 The bad news is Oculus have run short on the components that actually make the thing due to massive early demand, impacting the estimated shipping dates for some early adopters. The good news is that expensive shipping charge is now as imaginary as the worlds you are itching to immerse yourself in, as the Facebook-owned company is offering to foot the handling costs as reparations. You’ll also have an updated shipping estimate by April 12. In an email received by several developers and consumers explaining the situation (and provided to PCGamesN by Caretaker developer Byron Atkinson-Jones) Oculus stated that ‘all orders placed through today’ would have waived shipping and handling costs. There’s no telling if that offer’s valid for anyone purchasing today, but if the $50-100 shipping charge was really putting you off getting a $599 item then I’d try your luck. The original March shipping date for early pre-orders has also now been extended to July for new orders, and despite Palmer Luckey’s trip to Alaska to hand deliver the first pre-ordered Rift, that was apparently a one time deal.